Hilton Garden Inn LAX is an oasis in the heart of Los Angeles, located minutes from LAX airport and a short drive from all of the city’s top attractions. With its 162 comfortable, spacious rooms, host of convenient amenities, and central location, this hotel makes an ideal destination for your next business trip or vacation to LA. The hotel is located in the heart of the El Segundo business park district of LA, placing business guests right in the heart of the action. In addition, the LA Convention Center and Staples Center are just miles away. For families on vacation, Disneyland and Hollywood are easily accessible using the Mariposa Metro Rail right next door. The hotel offers a 24-hour complimentary shuttle service to get you to and from the airport without any hassles. Guest Rooms at the Hilton Garden Inn LAX rival your home when it comes to comfort and convenience. All rooms feature the patented Garden Sleep System beds, among the softest and most plush you’ll ever have the pleasure of using. Sleeping options include one king bed with optional sofa bed, and one or two queen bed setups. Rooms are furnished with an LCD HDTV with over 150 channels including NFL Season Pass, a work desk and office chair, a comfortable sofa or armchair, complimentary WiFi, microwave, and refrigerator. The hotel also features many accessible rooms. Families and business travelers alike will be pleased to know that the hotel provides everything you’d ever need for an enjoyable stay. A fully-equipped fitness room and heated outdoor pool and whirlpool can keep you in tip top shape and provide endless entertainment. Take advantage of the valet service, or simply park your car in the vast parking lot. An in-house 24-hour store, coin laundry, and friendly multilingual staff round out a great hotel experience. The hotel includes a comprehensive Business Center for valued business guests. Facilities are equipped with the newest technology, including complimentary WiFi and wireless printing right from your room. There is over 2,190 square feet of event space, including four spacious venues and a banquet hall that can be combined for an even more extensive space. Hotel staff are on hand at all times of the day to address your every need, quickly and efficiently. All of LA’s gorgeous beaches and parks, its exciting family attractions, and bustling nightlife, are within a stone’s throw of the hotel. Whether you’re a family or couple itching to ride the roller coasters at Disneyland, or a business guest looking to sign some deals in El Segundo or the LA Convention Centre, the hotel keeps you right in the middle of it all. The hotel’s Great American Grill restaurant, as well as exquisite room service catering, will keep you fueled and content for the duration of your stay. 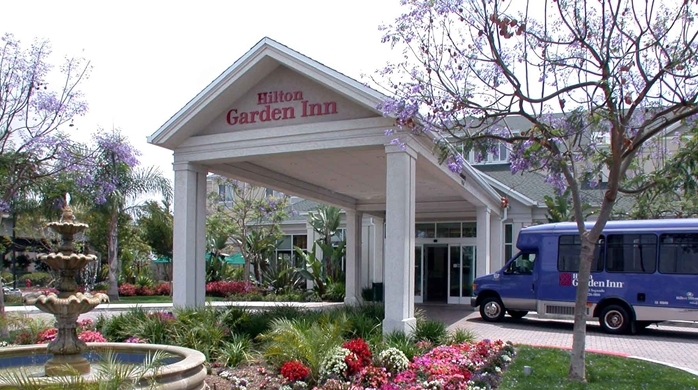 The Hilton Garden Inn LAX offers a hotel experience that few can equal. Its location within the busy El Segundo business park, and just minutes away from LA’s hottest sights and sounds, make this hotel an easy decision for your next hotel choice in this wonderful city. Hilton Garden Inn LAX is an oasis in the heart of Los Angeles, located minutes from LAX airport and a short drive from all of the city's top attractions.